Texture and pattern are the two keywords in this home’s stylish decor scheme. 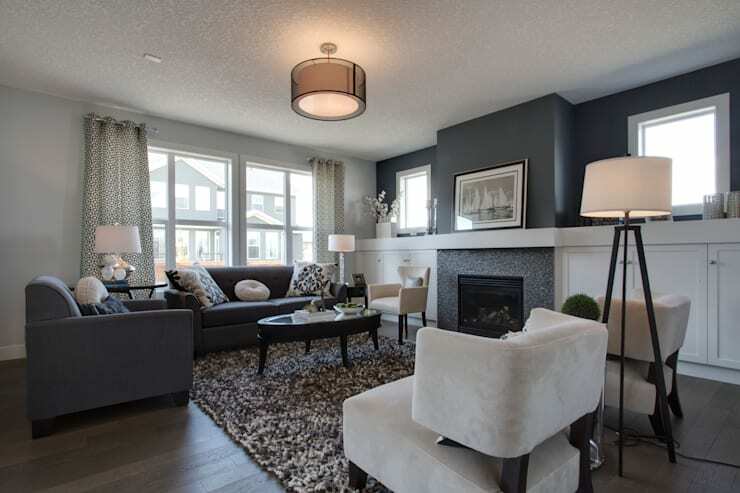 Brought to you from the professionals at Sonata Design, this show home was one of their first completed designs in 2014; the bold patterns and rich textures that they’ve incorporated make this a style that effortlessly triumphs over the tests of time. No detail has been left unattended—from floor to ceiling, this space exhibits a mastery of interior design, with every surface and object placed with intention in order to compose a visually engaging scene. The sitting room welcomes visitors in a wide range of tones from black to white, setting a polished, classic atmosphere that benefits from the formality of a black and white scheme. Playful patterns in the pillows and blinds pop out against a subtle backdrop of solid colours, providing a steady balance between busy and plain surfaces. Nowhere is there too much of any one colour; there’s no place in this room that is either over- or underwhelming. In other words, this room is notable for the way it settles into a well-composed balance! The furniture has been arranged in an almost symmetrical manner, with slight variations in colour and style giving personality to an otherwise mirror-esque layout. Opposite the wall painting, you find a display of flowers; opposite the dark grey love seat, you find a cream-coloured arm chair. 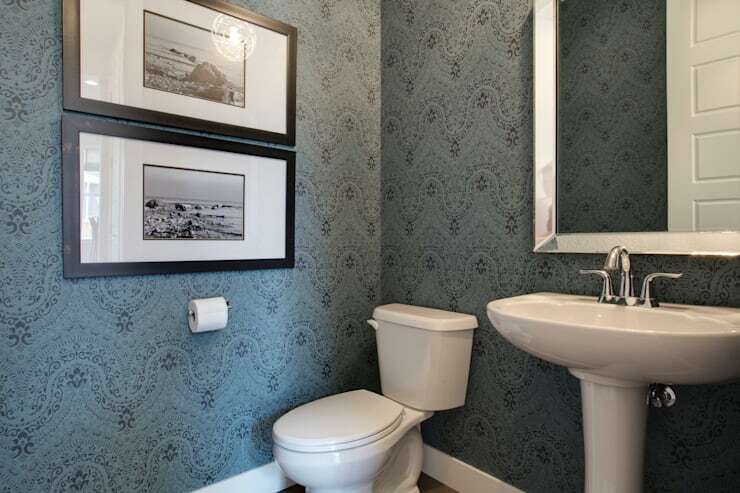 Although small, this half-bathroom enjoys an elegant ambiance thanks to the intricate wallpaper print (HOW Frozen Fusion 82157) that dresses up the surfaces of the room. 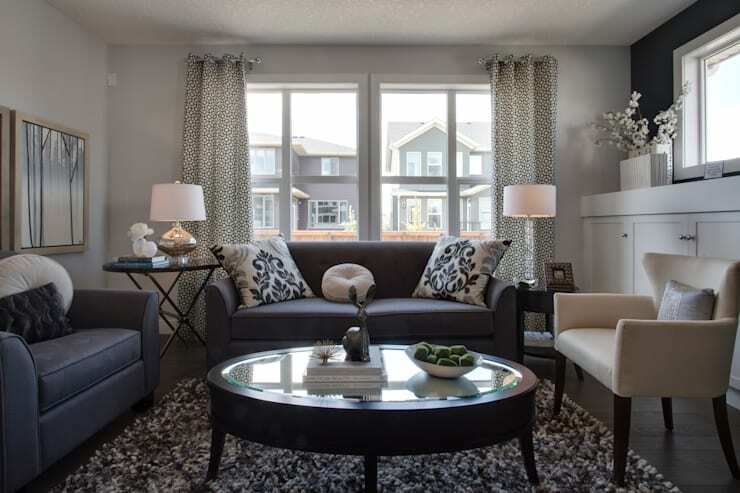 Here's proof that small spaces can absolutely thrive in dark tones and bold patterns! 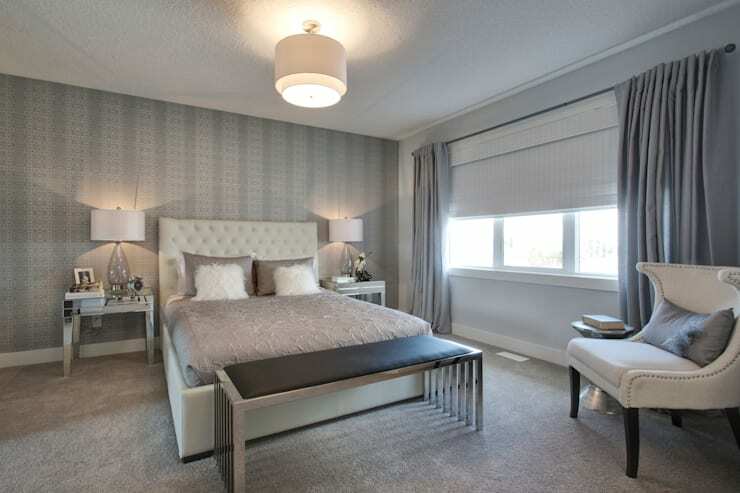 With a sense of elegance and luxury, the master bedroom offers a relaxing atmosphere distinguished by silver tones, plush textures, and a collection of mid-tones. Texture is found in abundance, from the fluffy faux fur pillows to the velvety grey carpet to the textured look of the intricately patterned wallpaper (HOW Frozen fusion 82004). For now, sunlight sneaks through the blinds (Hunter Douglas Provenance Woven Woods, here in Solstice Summer White); on sunny mornings, the blinds and thick grey drapes can be drawn across to provide a relaxing darkness for this sophisticated bedroom. Jumping out with a playful bird motif, Joanne Fabrics Paradiso 5036 44W6191 has been chosen for a statement wall in the second bedroom. 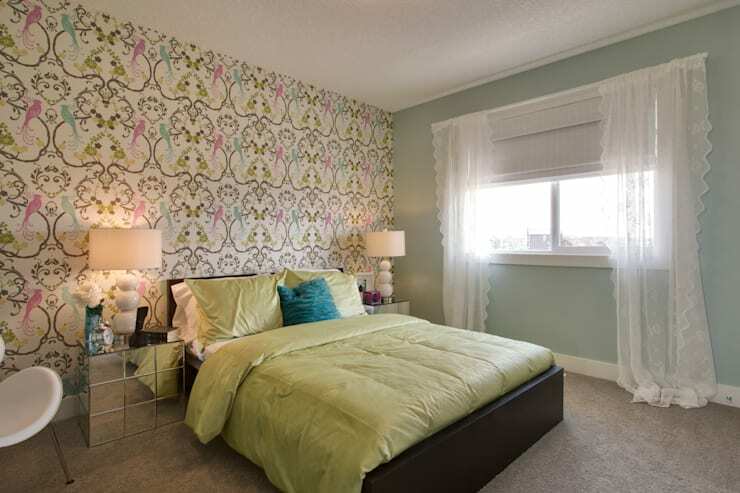 The rest of the room picks up the lively green and teal found in the wallpaper pattern for the creation of a cohesive theme. Filled with a sense of springtime rejuvenation, this lighthearted space keeps things feeling breezy and fresh, with sheer drapery adding to the dreamy atmosphere of the room. Share your comments on this interior decor below!